The Marais area of Paris is probably the most interesting one to be in on a Sunday, partly because it’s open. Like much of Europe, few shops in Paris are open on Sundays. 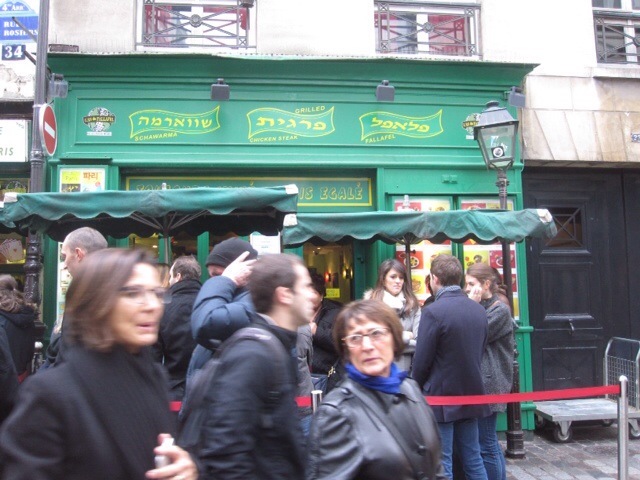 However, since the Marais was for a while a primarily Jewish neighborhood, the tradition of shops being open on Sunday has endured. Even as it has become more of a trendy, and in some parts gay, area, the Sunday opening piece has persisted. We started the walk at Place de la Bastille, where the French Revolution of 1789 effectively started. There were two more revolutions before France became a republic, but this was the start of it, where the citizenry stormed the Bastille Prison and ultimately demolished it. I’m sure this is why former President François Mitterrand decided that a new opera house for the people should be built in this square, providing a modern (some would say ugly) counterpoint to the Opera Garnier, which is situated near the high end department stores in a different part of the city. There is this cool thing called Paris Respire (literally “Paris Breathes”) where roads in parts of the city are closed to motor vehicle traffic on Sundays and public holidays. It’s supposed to facilitate cycling but the area in the Marais that was closed off was too full of pedestrians to imagine one could cycle through with ease. 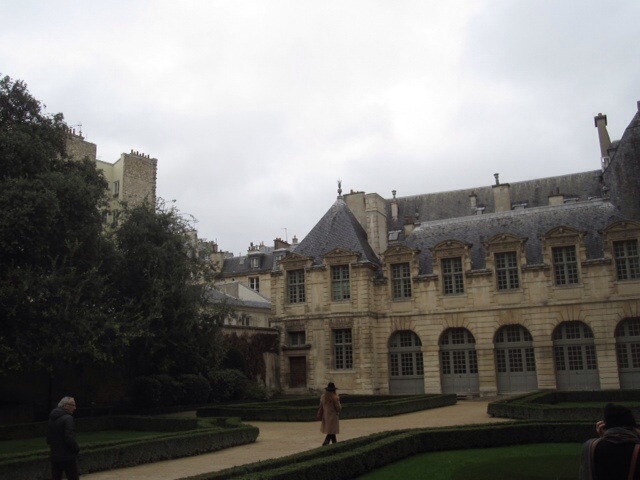 As we moved further into the Marais, the tour took us to Hôtel de Sully, a mansion of an upper class family from the period when the Marais was gentrified by Henry IV. 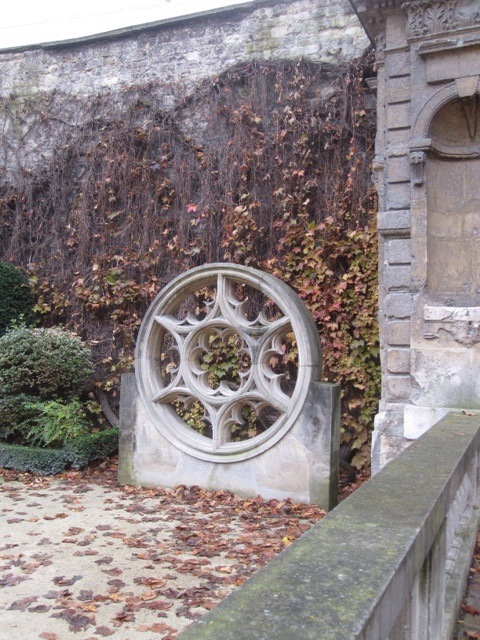 The building had peaceful courtyards and a bookstore that had some very appealing books, though not many in English, and the last section of the property took us onto Place des Vosges, which I may have mentioned before. This lovely square was built by Henry IV as part of his gentrification plan and it’s lovely. There are some art galleries with some very interesting pieces and I’m sure the cafés etc. are quite nice too. Victor Hugo lived there for many years, including when he wrote Les Miserables. The Marais went from aristocratic ‘hood to Jewish ‘hood, and avoided Haussman’s wrecking ball due to the start of WWI (see Angie’s previous post), remaining a primarily Jewish neighborhood for many years. It’s still a tourist attraction for that but has also become very trendy and gentrified. Some of the great Jewish stores have been replaced by trendy boutiques but there are still quite a few Orthodox Jews in the area. We passed the Agoudas Hakehilos Synagogue, which has a pretty interesting exterior but couldn’t go in because it’s not open to the public. It was built in 1913, in an art nouveau style by the same guy who did many of the metro stations of the time. It was the only religious building Hector Guimard ever designed. 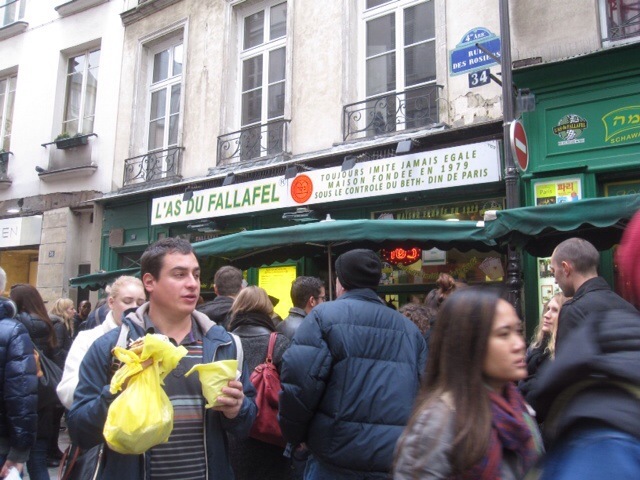 Inevitably (for us) lunch was at L’As du Falafel (no website). I don’t think there was such a long line when we were there in the summer in 2011, though it’s always busy. They seem to have gotten pretty organized about it, giving out numbers and approximate wait times. We waited less than the estimation of 25 minutes we had been given. There was a Moroccan man on line ahead of us who explained some things that were going on and we had a nice chat with him, wishing him a good lunch before finding that we were seated at adjacent tables. He was very nice and chatty and gave us his plate of fries, which we were only too happy to share. He was replaced at the table by a woman who sat down with her take out meal, which is strictly against protocol. As is the case in many restaurants in France, it costs more to eat in than take out. The man who was in charge of the line outside came and told her to leave. She tried to protest but the man would hear nothing of it. She offered to pay the extra but he was (appropriately I thought) not interested. He pointed out that there were people outside who had been waiting for 40 minutes (possibly an exaggeration) and there was no reason she should move ahead of them just because she had ordered from the takeout window. The food was generous and tasty, though I think the falafels at l’As are better than the schwarma. We stopped after lunch at a lovely store that had art and Judaica on sale and bought a mezzuzah for our new home for when we go back to it. We really felt the impact of Paris Respire as we walked out of the neighborhood and onto Rue Renard, across from the Pompidou Center as our walk drew to an end. It felt like the traffic was crazy after all that peace of no cars for a couple of hours. The last stop on our walk was to be the Hotel de Ville (the main town hall of Paris) but by this point the rain was coming down quite hard again, so we decided just to glance at it as we headed down the stairs into the metro to come back to the flat.